This article appeared in the New Port Richey Press on July 2, 1926. 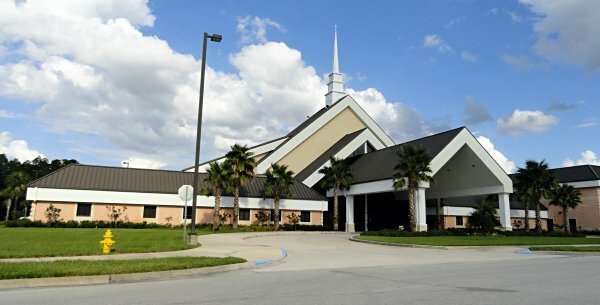 On next Sunday morning at eleven o’clock the Baptists of New Port Richey will open their new building for the regular services of the church. The sermon of the morning will be delivered by Dr. C. M. Brittain of the Florida State Board of Missions. Dr. Brittain is an interesting and forceful speaker and will no doubt bring an uplifting message. In the afternoon two deacons will be ordained when Dr. Brittain will preach again and visiting pastors will take part in the service. At night the revival meetings which have been planned for several weeks will be launched; for these meetings the services of two leading evangelistic workers have been secured, one, Rev. T. F. Callaway of Macon, Ga., who has had several years of experience in revival meetings and the other, Singer J. E. Busch of New Smyrna, Fla., who is unusually talented in his line of work. In these meetings the people of New Port Richey will have a splendid opportunity to hear the old time gospel preached and sung with power and effectiveness. The new building is constructed of hollow tile, is plastered throughout, and is finished on the outside in deep cream stucco, a very attractive color. The pastorium which stands by the church is finished on the same plan and is one of the most convenient and attractive bungalows in town. The church is amply supplied with separate Sunday school rooms, rooms for committee meetings and is in fact equipped for all departments of the church work. The Sunday School rooms are separated from the main auditorium and from each other by sliding doors, a kitchen is provided and the building will be supplied with excellent lighting fixtures and will contain a seating capacity of 500. This article was researched and written by Mrs. J. R. Mantey, Church Historian, in June 1972. At the urging of several Baptists in New Port Richey, Pastor A. E. Gammage of the Elfers Baptist Church responded to their invitation and started a preaching service on Sunday afternoons at 3 o’clock. They rented the Hall in the Snell Building at the Southeast corner of Adams and East Main St. and had the first service the first Sunday in January, 1921. Soon a Bible class for adults was organized and met immediately following the preaching service. The attendance grew until it was necessary to organize a Sunday School which was done in July with an enrollment of 100 and classes for all ages. The success of the preaching services and the Sunday School led to the organization of a Baptist Church which was constituted July 29, 1921. Rev. Gammage was called as the Pastor. Soon a prayer meeting was organized and held in the homes of members on Thursday nights. As early as September a large chorus of young people met on Tuesday nights to rehearse. Also a male quartette and a small orchestra. In August a Woman’s Missionary Society was organized with a full corps of officers and two Circles. The young people organized a Baptist Young People’s Union (B.Y. P. U.) with 35 members enrolled which met each Sunday night at 7 o’clock in a home. Since Snell Hall was available only on Sunday afternoons all other services had to be held in homes and by September they were outgrowing homes. About this time a number of families were moving away from Elfers. The church there released Pastor Gammage for two Sundays a month to the New Port Richey Church. Arrangements were made to rent Snell Hall for services at 11:00 A.M. and 8:00 P.M.
A Ladies Aid Society was organized August 15, 1923, as an auxiliary of the church, the purpose being to work for the building of a Baptist Church in town. Suitable lots were sought and on August 5, 1924, the committee reported closing the deal on the lot at Circle and Central Avenue. The corner stone laying service for a Church building was held on May 30, 1926, and the new building was opened for services the first time Sunday morning July 4. The building was constructed of hollow tile, plastered throughout and finished on the outside in deep cream stucco. The building would seat approximately 450. A pastorium was built just east of the Church and was first occupied in 1927. By March 1927 there were over a hundred members of the Church and 147 enrolled in Sunday School. A unified budget was set up for 1949. In 1952 a pastorium at 129 W. Delaware was built. In April 1958 the Church voted to establish a Mission in the Buena Vista area and on July 27, the ground breaking ceremonies were held and in August the name - Buena Vista Baptist Chapel - was adopted. It was constituted into a Church May 6, 1962, and the name was changed to Buena Vista Baptist Church. It is now known as the First Baptist Church of Holiday. Our Church was incorporated in March 1959. In 1960 the first unit of the new Educational Building was completed and dedicated the 21st of February, 1960. The second unit was finished in 1967. A Mission was established at Jasmine Lakes. The first service was held in the Clubhouse on May 6, 1962. A site was purchased in 1963 on Jasmine Blvd. west of U. S. 19. Building was begun and the Dedication Service was held on July 12, 1964. It was constituted into a Church named the First Baptist Church of Jasmine Lakes October 5, 1969. On November 3, 1963, our first Morning Worship Service was broadcast live over Station WGUL and has continued to the present time. In February of 1967 a Mission work was begun in the Moon Lake area with services in the Lodge Hall of the Moon Lake Assembly property, now known as the Pinellas Baptist Assembly grounds. It is still functioning and hopes to have its own property soon. Our Church sanctuary building has gone through several remodeling stages, the most recent in the middle 60’s. Now we are hoping for a new one in the not too distant future. Five pieces of property, adjacent to the original lot, were purchased in the period 1956 to 1969 and are in use. A library was re-activated in 1969 with 81 books and has grown to over 1150 at this writing. One man and his wife, Thomas and Janice Snyder, are leaving about the middle of July to go as missionaries to Honduras. The Church was in the Tampa Bay Baptist Association from 1921 until 1935. 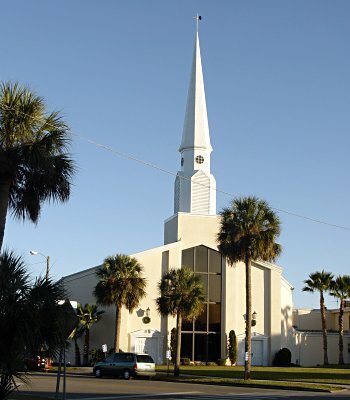 In 1936 it joined the Pasco Baptist Association and since 1955 it has been affiliated with the Pinellas Baptist Association, and the Florida Baptist Convention, all affiliated with the Southern Baptist Convention. 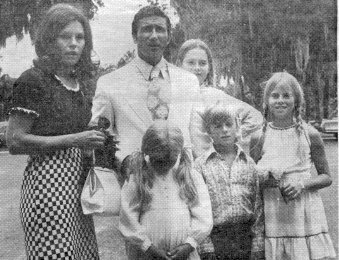 Col. and Mrs. James B. Irwin and their children Joy, Jill, James II and Jan in New Port Richey. at the home of Mr. and Mrs. Walter Casson of New Port Richey Saturday. This article appeared in the St. Petersburg Times on July 11, 1972. Slender, youthful, brown-eyed Mary spoke shortly after climbing down from the Irwin’s six-passenger Cessna plane with her husband and their four children. They flew into the Hidden Lake Airport at New Port Richey Saturday afternoon from Lake Wales where they had been visiting a friend. The family had had a busy day. They went to Walt Disney World Friday, got to bed at 2 a.m. Saturday, then Irwin played some early-morning tennis and the family later all went water skiing. Walter Casson, Johnny Myers and James Bottner took them on a tour of New Port Richey to show the astronaut his old home on the corner of South Boulevard and Illinois Avenue and the schools he used to attend when he lived here at age 11. “I knew kids at both the elementary and Pierce High School,” Irwin recalled. “This was because I spent a half a day in the sixth grade and a half-day in the seventh. My mother must have convinced the principals I was smart enough to be in the seventh part of the time,” he said with a laugh. The Myers and Cassons entertained the astronaut and his family at a buffet dinner at the Casson home. As soon as they arrived there, the astronaut’s children, Joy, 12; Jill, 11; James II, 9, and Jan, 8, and Cathy Myers and Leonard Casson disappeared to the cool backyard and engaged in badminton and tether ball sports. The astronaut and his wife were soon “Jim” and “Mary” to everyone present and they spent the evening talking of their plans, reminiscing about when Jim lived in New Port Richey and looking at old school annuals. Irwin was in New Port Richey to speak at the golden anniversary observance of the First Baptist Church where he accepted Christ when he was 11. The 1979-2008 church, on Dec. 21, 2003. More pictures of First Baptist Church are here. A picture of the Snell Building, where services were originally held, is here. A picture of James B. Irwin with his father and brother in New Port Richey in 1942 is here. A recent picture of the New Port Richey home Irwin lived in is here. The web site of the Florida Baptist Historical Society gives the following information on Rev. Gammage: A. E. Gammage (1872-1949) was born in England. He came to this country as a boy, where he later attended William Jewell College. He was the first pastor of the Riverside Church which he organized in Kansas City. His pastorates in Florida included Zephyrhills, Tarpon Springs, Elfers, and New Port Richey. He was the first pastor of Riverside Baptist Church in Miami in 1921. He later organized the Calvary Baptist Church, and served as their pastor for 27 years. 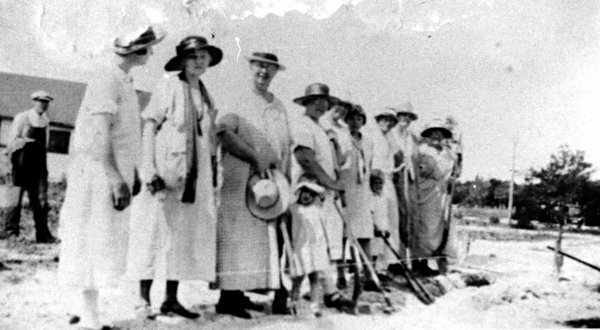 A 1927 article in the New Port Richey Press has: “The First Baptist church ... was established about ten years ago through the influence of Dr. Joseph Billheimer and the first meetings were held at his house.” On Dec. 4, 1931, the Evening Independent reported, “The community was much shocked and grieved Sunday by the sudden death of one of its much revered citizens, Dr. Joseph Billheimer. As has been his customary duty and pleasure for many years, he presided over the Sunday school of the first Baptist church as its superintendent. His last words were a plea to the young people to give their hearts and lives to the Christ whom he served.” The article also reported that he and his wife came to New Port Richey in 1919, and, as there was no Baptist church here at the time, he helped organize one and has been its staunch supporter ever since. An article in Literary Florida, Oct. 1947, has: “The First Baptist Church located on Central Avenue, was built in 1926, having organized about 1918 in a small store building on the site of the old John Snell home corner of Central Avenue and Adams Street, later going to the Snell Hall on Main Street, which is now demolished, to hold services. The final service in the 1926 building was held on Oct. 29, 1978. While the new building was under construction, services were held in the adjacent educational building. At this time Rev. C. Thomas Bennett was pastor. In 1991 land was purchased at 6800 Trouble Creek Road as the site for a new church. In 2000 the Rev. Guy S. Sanders III became the pastor of First Baptist Church. On June 22, 2008, a car parade consisting of 75 cars and prayer walk around the perimeter of the new church were held. A special dedication service was held on July 20, 2008. On Feb. 21, 2014, two adults from First Baptist Church were killed when a van carrying church youth overturned and crashed in Lake City. Others in the van were injured. In 2017 Jay Huddleston became the church pastor. Walter A. Casson Jr. provided much of the material used on this web page.